Mike shakes me awake from a deep sleep “Ugh, what are you doing?” I mumble still with my eyes still shut. “There are animals running around our tent” I could hear the excitement in his voice. You could hear a whinnying in the distance and another set of hoofs clop past the tent. I think I must have fallen back to sleep after that because I have no recollection of Mike exiting the tent in the middle of the night to go and chase galloping hoofs! In the morning on my way to the toilets I spot hoof prints in the sand. They don’t look like what you would expect a zebra to make, but more like a deer would have. I made a mental note to look it up online when we got into Luderitz that night. Walking back from the toilet block, I grabbed my phone from the charger and flipped through my emails. One in particular stood out “I’m sorry to do this… but”. I feel my heart is pumping inside my chest as I open up the email. “Judith (my great aunt who I’m very close too) has past away due to complications from the operation”. I had spoken to her before the operation, I had consistent updates from my uncle and my aunt about her lack in progress. After three long weekends in ICU she decided to move on and leave this world. I walked back to our campsite. Mike took one look at me and asked what’s wrong as he wrapped his arms around me. “My aunt died…” My voice sounded higher than normal, as the flood of emotions, memories hit home. I crumbled and started to sob. When I managed to regain my composure, I continued to pack up our gear. “Are you sure you want to ride today?” Mike asked I look at him with tears brimming “I think I need too. I can’t just sit here and wallow in…” I wave my hand around the campsite “I need to transfer that energy into something. Plus its meant to be an easy ride to the main road and asphalt from there onwards to Luderitz” “Just let me know if you want to change your mind”. I was grateful for Mike support. He’s never meet my aunt Judith but has heard many stories about her from me, and never how much I care for Judith and how much Judith took care of me when I needed it. My mind is scattered, my heart is hurting but I managed to hold myself together as I asked the petrol attendant where the next petrol station is. He points to a town on my map and explains that its just 10kms off the main road. Thats perfect I think to myself. That means I don’t have to carry any extra fuel today. But I missed one important detail in that exchange of information, which I did not discovered until later when it was too late. I have no idea what the road condition was like, what amazing scenery I happen to be flying past on my motorcycle that day. My mind was buried deep internally. Searching through banks of memories, replaying them like mini movies. Snippets of conversations appear in front of my eyes. Her contagious laugh. The feeling of getting what she called a hot squishy hug from her, when I was feeling down. Boy, I really needed one of those now. I gulp, as I realised I never will, ever again. My helmet is full of music, its Adel. Her strong voice, powerful lyrics ring home. I turn up the volume hoping it will dull down the pain. Of course it doesn’t work, that will only come with time. Its just so hard, to be so far away from my family right now. Riding my motorcycling in a foreign country. Surrounded by strangers. I’m meant to be enjoying myself, I have been enjoying myself while I have known my family is suffering. I know, that there isn’t anything I can do to bring Judith back, but I have this urge to stand by her husband, my uncle, someone I care so much for. Just want to help him in anyway possible. But I feel so helpless here. The only comfort I can hold onto is knowing my Aunty Chriss dropped everything to be there for him. We arrived at the intersection where we are meant to turn off and go and get fuel. I see a small sign that says its 30 kilometers to the town. I look down at my map, confused. The guy told me it was only 10 kilometers. A 60 kilometer detour is just crazy. It will add an extra hour plus to our driving time. My map agrees with the sign. I realised my mistake at once. I was stupid, so stupid. In Namibia, you can not afford to miss calculate petrol. I indicate to Mike we should stop, quickly making new calculations in my head. “Um, I’m sorry but I really fucked up” I say to Mike through my helmet “To get to Aus, I really only need another three to four liters of fuel, do you think you have that much spare to give to me so we don’t have to do a 60 kilometer detour?” Mike looks down at his transparent plastic fuel tank, then back to me “Sure, I have more than enough to get us both there” I sigh with relief that Mike has a 33 litre tank with a range of 600 kilometers. We ride on and on and on, it feels never ending. The temperature drops as we climb up to 1600 meters above sea level. I can feel the cold creep into the gaps between my clothing layers. Both Mike and I are not prepared for the temperature change today. We had decided it was getting warmer and left off one extra layer that morning. When we stopped to top up my tank, I give Mike my thin but warm gloves to wear under his summer motocross gloves that were full of holes. In hope to regain the feeling in his fingers. Just Kilometers from a town called Aus, we were passed by a motorcyclist wearing a South African number plate. I wonder if that’s Kevin, a guy I have been chatting to regularly through Facebook. He left Cape Town five days after us, but I knew he would pass us, today might be that day. Mike and I turned off the main road and rode into the center of Aus to the only petrol station between Canon Roadhouse and Luderitz. 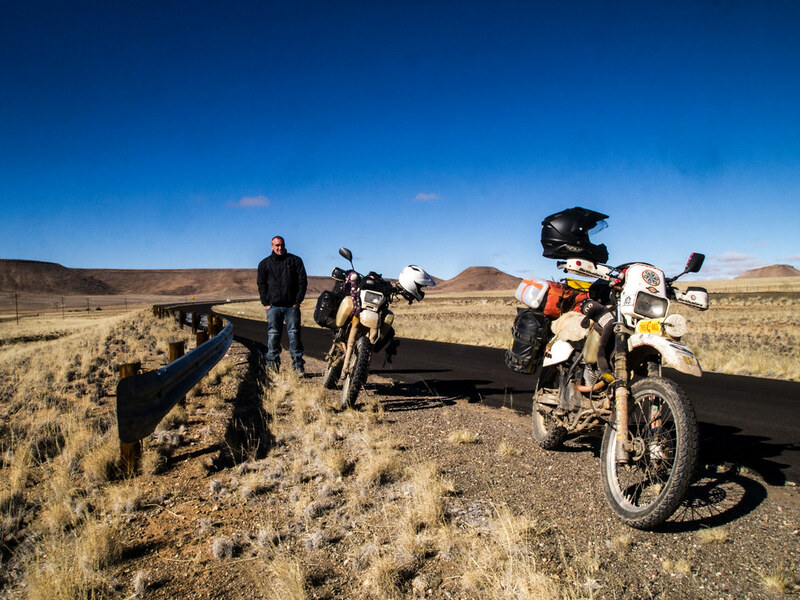 This is where we found the South African motorcyclist. Just as I pulled off my helmet, he approached me. “Hi, I’m Kevin” and holds out his hand for me to shake “Sorry I just passed you like that, I was getting pretty tired and needed the cool air to wake me up” Don’t I know it I think to myself. I just want to be in Luderitz now and have a glass of wine in my hand, but we still have another 120 kilometers to go. Kevin took off first, I was glad because we travel slowly and stop often. I don’t want to feel like I’m slowing someone down. Luderitz is a small town. I know we will see each other again. My tank was full, but my hands still feel stiff with the cold. The petrol attendant sees me fumbling trying to put my petrol cap back on and he kindly does it for me. I look up at him and smile gratefully. One hundred and twenty kilometers to go. That equates to five litres of fuel, two hours, 12 vistas and roughly three stops. By breaking it down like this I think it helps me put the distance into manageable number. In fact its still just 120 kilometers. A road sign appears, and slips behind me with an exclamation mark and a picture of a hyena on it. I instantly perk up and search the surrounding area. A few kilometers another sign appears but this time is has a horse on it. Now my eyes look into the distance but still fails to pick out anything. Ahead of me, Mike slows and turns off the main road and continues to ride down a long sandy road. I turn off and follow him. The sign says “Wild Horses Viewing Point”. We arrived at the car park and sure enough there are three in the distance. To us they were just horse silhouette on the shimmery background but It still was nice to see. 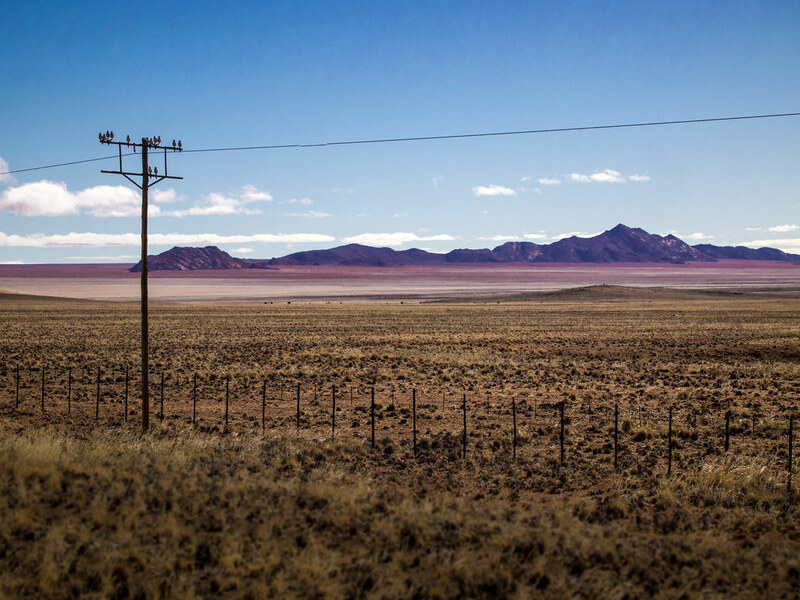 As we got closer to Luderitz the scenery on either side of the road turned into a full on desert with rolling dunes. We were riding along the only link to the coast – this asphalt road. The wind picked up, weighing down heavily on my weariness. It did look beautiful as the golden sand snaked across the black asphalt road. I stop to take a picture of Mike with the sand dunes. When I climbed back onto my bike I suddenly felt lethargic. The effort I needed to kick start my bike, the strength I needed to lift my bike off the side stand was really tough! Only twenty kilometers to go, that equates to twenty minutes, two vistas and one litre of fuel. This has been a very strange emotional day. One that took everything from me and only gave me back weariness, a heartache and yet another life experience. I guess no one is invincible. I should know this better than anyone else, but its so easily forgotten. This is just another reminder why I am doing this, why I am following my dreams – Life is too short. Hi Danielle, impressive story, reading it with a lump in the throat, goosebumps and cold fingers. I agree, Life is short! So enjoy it and cherish your loved ones! Looking forward to your next Blog. Thanks a lot Gabri, I was hoping to achieve that feeling in my writing. Beautiful Danielle, sorry for families loss, keep on keeping on as the saying goes. 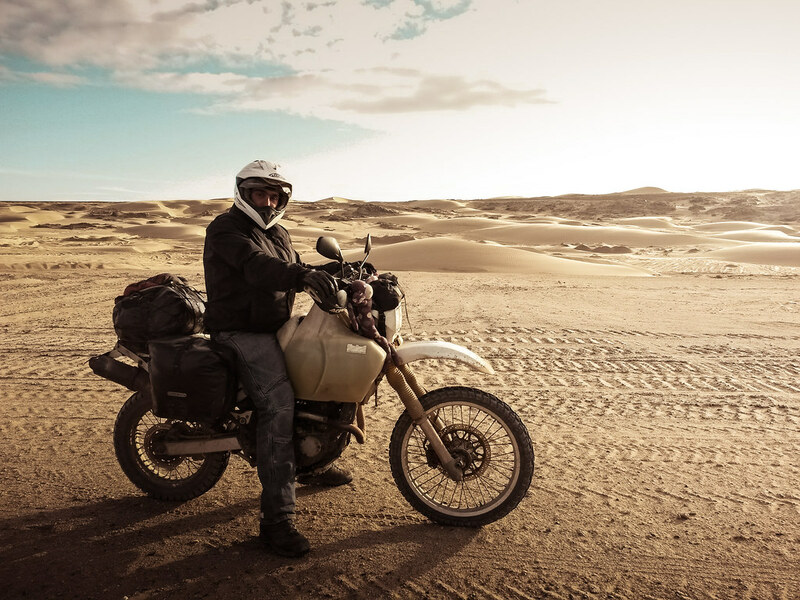 Enjoy Namibia and say hi to Mike. Ride safely you guys. I cried. I miss Judith, it’s hard going to their house as I am still expecting her to burst in the door, from art class or red hatters, to see what is going on and what everyone is up to, talking her hilarious stories about the happenings of her day. She will watch over you forever. I know what you mean, when I think of home I think of her there. It will take some time to rewire that feeling. 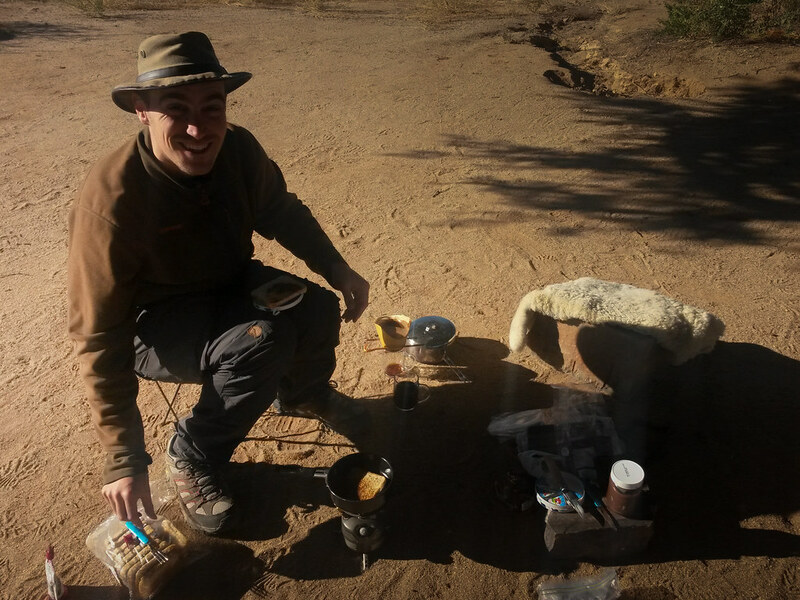 Thanks a lot Sheldon, despite everything we are enjoying Namibia – how could we not! Mike says Hi!